Chicken. Proscuitto. Sage. Squeezed lemon. Haricots verts. Shallots. Zest. Sounds fancy doesn’t it? Go ahead, let your husband/girlfriend/roommate/Mom/neighbor/schnauzer think so. The truth? This dish is ridiculously easy to make. 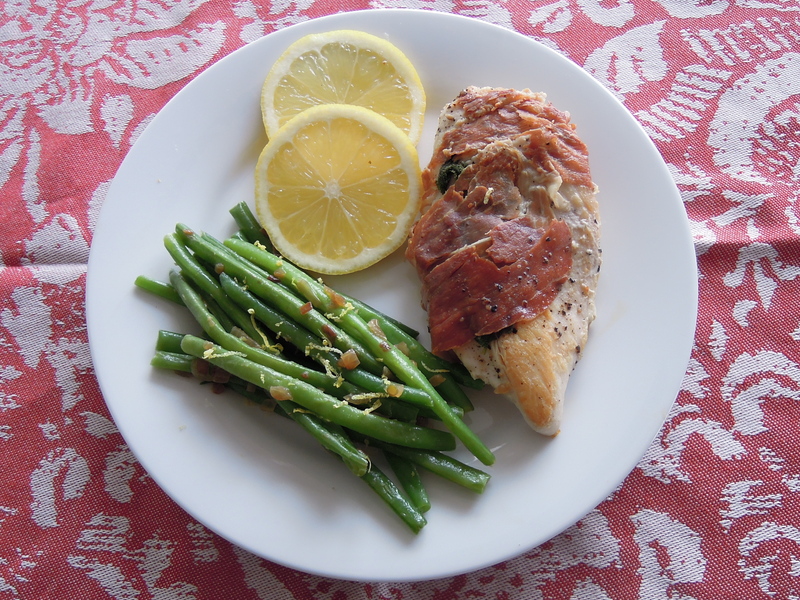 Certainly easier to make than it is to say…chicken saltimBOCCA! And the green beans totally seal the deal for me. They’re pretty much the most exciting green beans (sorry….haricots verts) I’ve ever eaten. Plus, they involve shallots, which currently fascinate me–they’re in bulbs with cloves just like garlic and yet taste like mild onion. What’s up with that? Fascinating. If you’re currently in a chicken, steamed broccoli, and brown rice rut (or salmon, spinach, and sweet potato as the case may be–trust me, I’ve been there) I’ve got your weeknight solution right here. No reservation necessary. Season the chicken with salt and pepper. Place 3 sage leaves on each cutlet. Wrap 2 pieces of prosciutto around each one, securing the sage in place. Heat a skillet over medium heat and add 1 Tbsp oil. Place chicken in pan and cook on each side until done (2 to 5 minutes per side). You may need to do this in 2 batches to avoid overcrowding the pan. Add additional oil between batches, if necessary. Remove chicken from pan to plate and tent with foil. In a bowl, combine broth, lemon juice, and cornstarch. Stir with a whisk until smooth. Add to pan and bring to a boil, stirring with the whisk constantly. Cook until slightly thickened–about 1 minute. Spoon sauce over chicken or serve on the side. Blanch the haricots verts: Place in a large pot of boiling water for 1-2 minutes (until they turn bright green–string beans may take longer). Drain and place immediately in a bowl of ice water to stop the cooking. Return pan to stove on medium-high heat. Add butter and olive oil. Once butter is melted, saute the shallots until they turn brown–2 to 5 minutes. Drain the string beans and add to the shallots. Saute, tossing well, until beans are hot. Season with salt, pepper, and lemon zest. This entry was posted in Chicken, Vegetables on January 26, 2012 by Paige Greenfield.